With Analytics powered by Relay, schools will finally be able to draw insights from their wide array of data and answer their toughest questions. Is what you’re paying for actually being utilized as intended? Have you implemented redundant tools that present an opportunity for cost-savings? How often are applications used and for what? Do your resources achieve digital equity? Analytics powered by Relay uses Lightspeed Systems’ proprietary Smart Agents to view and report on all traffic from the root level of school devices. Agents are run in invisible report-only mode and do not disrupt or delay activity. Analytics powered by Relay can be used in conjunction with Relay filtering, providing not only reporting but also powerful filtering tools to allow and block traffic, apps, and resources. Analytics powered by Relay is the most complete analytics solution available: It supports every OS, everywhere school devices go, plus every browser, app, and user. 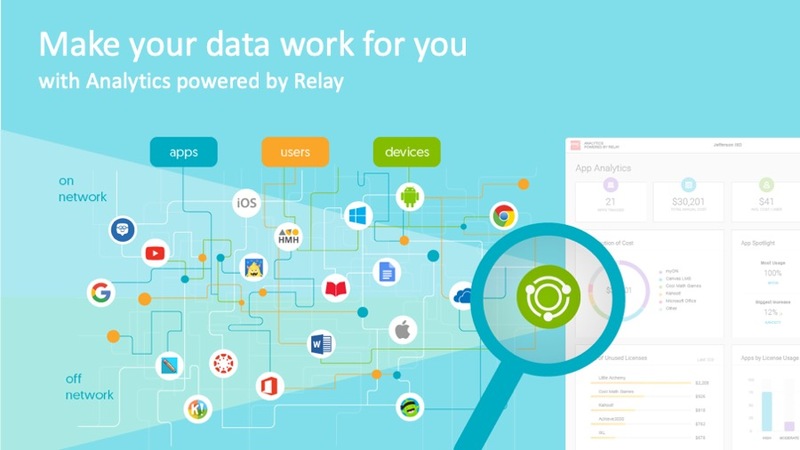 Want to learn more about Analytics powered by Relay or schedule a demo? Contact CDWG now.